Sebastian Vettel won the Bahrain GP tonight in his Ferrari, 0.699 seconds ahead of Valtteri Bottas and 6.5 seconds ahead of Lewis Hamilton in third place in their Mercedes. The win is Vettel’s second of the season and 49th career victory. Pierre Gasly (62.2s), in the Toro Rosso-Honda finished in fourth, followed by Kevin Magnussen (75.0s) in the Haas-Ferrari in fifth, Nico Hulkenberg (99.0s) in the Renault in sixth, Fernando Alonso (1 lap) in the McLaren-Renault in seventh, his team mate Stoffel Vandoorne in eighth, Marcus Ericsson in the Sauber-Alfa Romeo in ninth and Esteban Ocon in the Force India-Mercedes in the final points scoring position. Before the start, the sun set over Bahrain and the teams prepared for the start. Vettel was on pole, with his Ferrari team mate Raikkonen alongside on the front row. 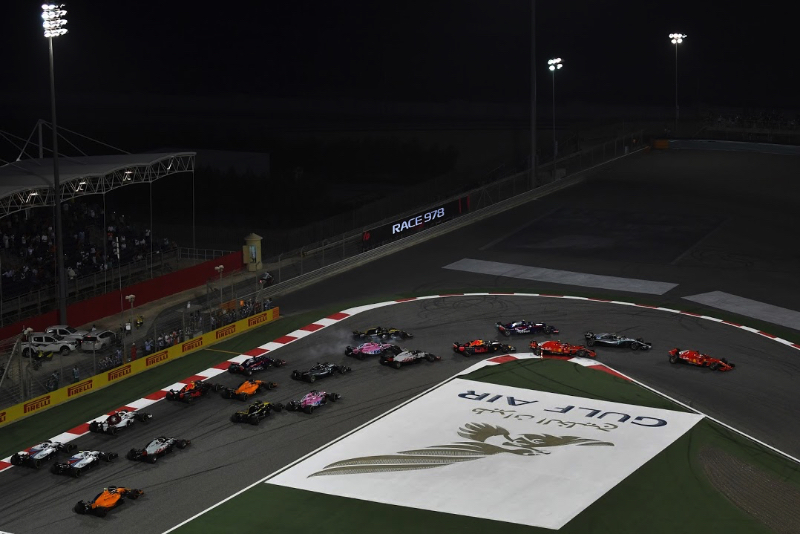 Bottas and Ricciardo were on row two, Gasly and Magnussen on row 3, Hulkenberg and Ocon on row 4, Hamilton (with a gearbox change penalty) and Sainz rounded out the top ten. The top eight starting on supersoft tyres, Hamilton, Perez, Alonso and Verstappen starting on soft tyres. At the appointed time, the grid cleared, the cars came around, and the lights went off and the race began with Vettel on pole taking the lead, Bottas, Raikkonen, and Ricciardo following. Hartley and Perez touch, and Perez spins on the first lap. At the end of lap one Verstappen tries to pass Hamilton, the two touch, Verstappen gets a tyre puncture and limps back around to the pits - at the same time Ricciardo pulls off the track with a mechanical problem - the virtual safety car is deployed. The race resumes with Vettel in the lead, Hamilton passes Ocon and Hulkenberg for sixth place, Alonso passes Ocon for eighth. On lap 5 Verstappen pulls off the track with a mechanical problem as well. Vettel sets fastest lap at 1m35.721s. Hamilton passes Magnussen for fifth place. Vettel goes fastest with a 1m35.369s. On lap 7 Hamilton passes Gasly for fourth place. It is reported that Hulkenberg is struggling with his battery. Ocon reports that he is sliding all over the track. Hartley is handed a 10-second penalty by the stewards for his incident with Perez. At lap 10 Vettel leads Bottas by 2.9s, followed by Raikkonen (6.2s), Hamilton (14.9s), Gasly (20.2s), Magnussen (23.3s), Hulkenberg (24.7s), Alonso (26.1s), Ocon (28.1s) and Hartley (29.7s) in tenth place. On lap 11 Stroll pits with a damaged front wing, takes a set of supersoft tyres and continues. On lap 13 Magnussen pits from sixth, takes on another set of supersoft tyres and rejoins still in sixth. Alonso pits from eighth, Gasly, Hulkenberg and Ocon pit as well. On lap 19 Vettel pits from the lead and switches to soft tyres, and rejoins in fourth. Bottas takes over the lead. The next lap Raikkonen pits as well for soft tyres and rejoins in fourth behind Vettel. On lap 20 Bottas pits for medium tyres. Vettel sets fast lap at 1m34.696s. At lap 21 Hamilton leads Vettel by 5.2s, followed by Bottas (12.5s), Raikkonen (14.1s), Gasly (33.4s), Ericsson, yet to pit (39.0s), Magnussen (39.9s), Hulkenberg (40.5s), Alonso (44.2s) and Vandoorne (52.3s). Raikkonen sets fast lap at 1m34.411s. Then Bottas sets a fast lap of 1m33.740s on the medium tyre. Magussen passes Ericsson for sixth place. On lap 23 Ericsson pits for medium tyres. Vettel is closing on Hamilton in the lead. On lap 26 Vettel passes Vettel for the lead into the first corner. At the end of the lap Hamilton pits for the first time and switches to medium tyres and rejoins in fourth place. On lap 28 Magnussen pits again for soft tyres and rejoins in 12th. Magnussen then passes Perez for 11th and then Ericsson for 10th. Ocon, Grosjean and Magnussen battle for eighth place. Magnussen complains that Grosjean is holding him up. Grosjean pits. At lap 30 Vettel leads Bottas by 4.1s, followed by Raikkonen (6.1s), Hamilton (22.7s), Gasly (38.4s), Hulkenberg (49.1s), Alonso (53.0s), Ocon (68.0s), Magnussen (68.7s) and Ericsson (71.6s) in tenth place. On lap 32 Magnussen passes Ocon for eighth place. On lap 34 Perez pits for supersoft tyres and rejoins in 16th. Gasly pits from fifth for supersoft tyres and rejoins in seventh ahead of Magnussen. On lap 36 Raikkonen pits from second, switches to soft tyres, and starts going before the left rear change is finished, and hits one of his mechanics. Raikkonen stops down the pitlane and gets out of his car and retires. The mechanic is taken to the medical centre. Ocon pits for soft tyres. Ferrari radios Vettel telling him to switch to plan B. At lap 40 Vettel leads Bottas by 7.5s, followed by Hamilton (18.5s), Gasly (69.6s), Magnussen (73.0s), Ericsson (87.6s), Hulkenberg (88.5s), Alonso (91.7s), Vandoorne (1 lap) and Hartley in tenth place. On lap 40 Alonso and Hulkenberg pit. Hulkenberg passes Ericsson for sixth. On lap 44 Alosno passes Ericsson for seventh on fresher tyres. Ocon passes Grosjean for 11th. On lap 46 Grosjean pits, the team clearing away a broken bargeboard and rejoins in 16th. At lap 50 Vettel continues to lead Bottas by 4.9s, followed by Hamilton (17.8s), Gasly (68.2s), Magnussen (73.3s), Hulkenberg (88.1s), Alonso (89.5s), Ericsson (1 lap), Vandoorne and Sainz in tenth place. On lap 51 Bottas closes to 3.4s with Vettel starting to slow with well-used soft tyres. On lap 52 the gap is down to 2.4s, Bottas running in the 1m34s, Vettel in 1m35s. Vettel is complaining about left front tyre vibrations. On lap 54 Bottas closes to 1.5s behind Vettel, and 1.2s the next lap. On lap 56 Bottas closes to under one second and is right behind the Ferrari. On the final lap, Vettel holds off Bottas to win the Bahrain GP. After crossing the line Vettel says, “these tyres were done for the last 10 laps!"